Andrés Cajiga Ramírez was born in Mexico City in 1970 and studied Architecture at the Iberoamericana University, Santa Fe campus. His great interests, ability and experience in design, coordination and supervision of developments in Mexico and abroad shown by Andrés over more than 25 years of professional career in architectural design has qualified him to be Project Leader at Sordo Madaleno Arquitectos since 2011. 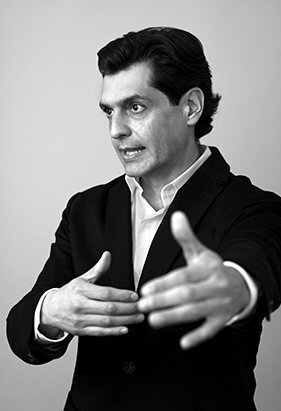 Within his career at SMA, he has directed projects of great importance for the office, such as Grand Hyatt Playa del Carmen (2015), Hyatt Regency Andares (2017) and Andares Corporate Building (2017) of Masterplan Andares in Jalisco, the Antara Expansion (2018) and the mixed-use development recently inaugurated in Mexico City, ARTZ Pedregal. His fascination and curiosity for the development and application of sustainable design systems led him to study a Diploma in Sustainable Design and Construction at the Iberoamericana University. Since then he has incorporated this knowledge into the projects under his leadership. Between the years 1994 and 2011 Andrés worked with the firm De Yturbe Arquitectos as project leader. Over this period he directed the design and development of a range of domestic and international projects, above all residential and touristic in nature, including a Resort and Marina in the Sultanate of Oman, Signature Villas in Dubai, a residential development in Murcia, Spain, El Nejapa Country Club in Nicaragua, among many others.